How long can West Chester Township continue to grow? The community was ranked No. 38 on Money Magazine's list of the best places to live in the United States, and more development is on the way. 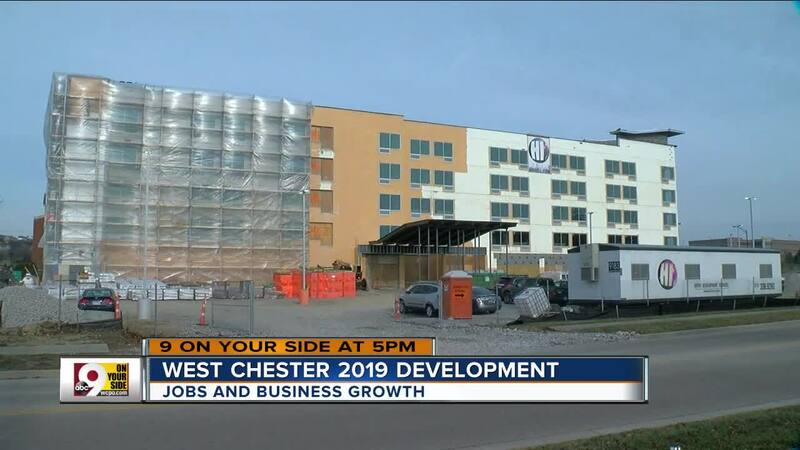 West Chester, a longtime driver of regional growth, will continue its expansion in 2019 with more than one million square feet of new development and a bevy of incoming businesses. "We continue to be a center of growth in the Cincinnati region and also the state of Ohio," said West Chester director of community development Aaron Wiegand. The largest project is the three-building West Chester Trade Center under construction at the corner of Union Centre Boulevard and Princeton-Glendale Road. Developers planned the project without any signed leases, Weigand said. "It show's the strength of the market when companies are willing to build a million square feet of new space with no tenant identified," he said. Eighty-five percent of the first two buildings were leased by Wednesday. Wiegand said he believes it won't be difficult to find occupants for the third. Companies already to set to move in to the West Chester Trade Center include TSC Apparel, a Cincinnati-based business-to-business printed apparel company, and MS International, a California-based flooring, countertop and hard-surfaces supplier. Garage door maker Amarr is also slated to move into the center some time this year. West Chester is the 38th "Best Place to Live in the U.S.," according to Money Magazine. It was also the only Ohio community to make the list, which looks at a number of factors such as population, median family income, median home prices and job growth. The magazine projected that job growth in West Chester will be 4.48 percent through 2022. "We look for targeted industries, specifically things like advanced manufacturing, medical, bio-pharmacy type things," Weigand said. "Things that will create those high-paying jobs in West Chester." Other forthcoming developments include TriHealth's new 50,000 square foot medical office, a new Kroger Marketplace store opening Thursday and a new Aloft hotel near Union Center Boulevard. One change some residents and workers in the area will notice is a transition to increase the number of walkable areas in the township, Wiegand said. "The new thing that people are looking for is live, work, walk pedestrian access," he said. "West Chester has not always been built that way." He said newer developments are including sidewalks and, in some cases, sidewalks are being added to existing developments. At the same time, it may soon become difficult to find large tracks of undeveloped acreage in the Butler County township. "Today's industrial clients want 40 to 50 acre lots. And, we frankly don't have a lot of those left because of the development," Wiegand said.